CyberGhost VPN is a company almost fully run in Romania now, with most of the team and the decision factors in Bucharest. They're preparing to launch a new version of the product, aiming to make their service as easy to understand and use for the non-tech people who want to surf the web in privacy and anonymity. This is why, this Friday, we're waiting for you at TechHub to help them test their new product version. You'll get a nice free day of working in our co-working space and a free premium account from the CyberGhost team, to reward you for your time. But before we meet you on Firday, here are some interesting facts you might want to know about CyberGhost VPN - the product and the company, its team in Romania and a few explanations about the event, all from Iulia Porneala, product manager. Please tell us a few words about CyberGhost VPN. What does the product do, what problem does it solve and who are its users/customers? Technically speaking, CyberGhost VPN encrypts your internet connection and hides your IP address, allowing you to surf the internet anonymously. Doesn�t sound too complicated, does it? But in order to provide a solid, trustworthy service, besides a sophisticated network, hundreds of servers, programmers and experienced technicians, you need determination, passion and thousands of hours of hard work and dedication and that�s what sets CyberGhost apart. Our main goals are to help our users keep their personal data-like credit card number or passwords-from data miners and hackers and to assure they can roam the internet freely and access all kinds of blocked or censored content, while ensuring their online anonymity. In short freedom, security and anonymity. That is what we stand for. This issues concern a significant part of world�s population, as you can imagine, for freedom didn�t die yet among common people, as it seems to have died among their leaders. That�s why we have users in all parts of the world, from Libya to the United States. Please tell us a few words about CyberGhost, the company. For how long has it been on the market, how and where was it started and how was it developed? CyberGhost VPN was initially developed nearly ten years ago by a small software company in Germany, before it moved to Bucharest, Romania, where it finally found the perfect environment necessary to reaching a critical mass of users. Way back in Germany, CyberGhost managed to stay alive in a time when the life-expectancy of products was usually short, but it needed the right person to reach an organic exponential growth. 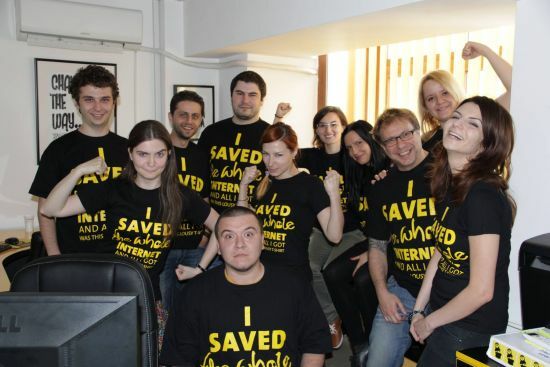 Robert Knapp, co-founder and CEO of CyberGhost, saw the potential of both the unique product and Bucharest, Europe�s new Silicon Valley, and successfully brought them together in 2011 � for the sake of evolving the old CyberGhost to the best VPN product out there. Please tell me a bit about the Romanian team - how many people are you, what are your roles in the company, any other interesting facts? We are here to bring CyberGhost VPN to the top � and we got along quite successfully up to now, as it can easy be seen. The company consists of 21 employees with a couple of programmers still located in Germany, but is mostly driven by young, curious and ambitious youngsters from Bucharest, focused on finding new and better ways to provide the best and most effective way of Internet security: anonymity. In hardly two years the team established an extraordinary service with more than 2.1 million users � (that�s the number of people living in Paris). Right now, CyberGhost has 3.000 new accounts per day, set up by people from all over the world, and more than 6.000 active users a day. That�s double the number of daily users from just 12 months ago. What's going to happen on Friday? Why are you organizing this event? Right now we�re trying to reach the tipping point, where we can communicate to both technical and non-technical users. People don�t know what a VPN is, and most of them don�t care. But they do care about their privacy, security and freedom. That�s why we need the community�s help to make the product as easy as possible to use. We offer an amazing free service, so anybody can benefit from that. But it�s often hard to find the way to communicate to people that there is a product which can solve their problems. Friday, we�re putting to work all our resources to bring in people which can to test our service and help us learn. For their time we�ll reward them with a full version of our premium service. You're a young product manager in Romania. Tell us a few words about yourself, how did you get to where you are now, what's it like to be a product manager? My career started as an ecommerce manager which I see right now as a stepping stone in the way to my current position. Due to that previous experience I was able to handle the current job requirements. Doing product management is a challenge right now, because it�s a new area. Until a few years this job didn�t even exist, it�s not a domain where there�s already a lot of expertise. It�s a relatively new thing, so sometimes you�re in front of a problem that hasn�t been tackled before by others. That�s tough but incredibly rewarding at the same time, because you explore uncharted territory. It�s history in the making. It�s all about what you want as a professional, about what gets you going. Just a short word of advice for the new entrepreneurs out there: make out of your job a mission of solving a problem in the world and you'll feel rewarded every day of your life. Right now there are people out there doing this, and you can get a lot of feedback and input from them, be sure that somewhere somebody might stumble upon the same problem as you do. And thanks to the internet you have the means to reach people all over the world and interact with them. I often get the question: �What does a Product Manager actually do?�. Well, you do a lot of things, you act as a liaison between all the teams and members that are involved in your product and give them a common direction. You have to understand your user, his needs, create a relationship with them, listen to their problems, keep an eye on your competitors, create, design, experiment, measure, always think outside of the box, be agile and most important-never stop learning.